The Czardas was built in South Africa and, not surprisingly, the AC power system was built to local standards. That system was still intact with one end of the shore power cable modified so that the boat could connect to a typical US 30 amp marine outlet. The system was unreliable and unsafe. It needed to be replaced and was first in the critical path of bringing the boat back to life. 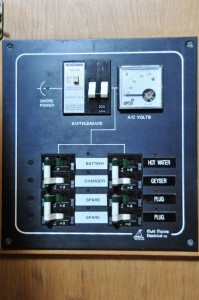 South African mains power supply is 220 volts at 50 hertz and the boat’s shore power inlet used an M type connector (three round prongs). The US standard is 120 volts at 60 hertz and typical 30 amp marine connectors are NEMA L5-30P (three blades, each with a different profile). The boat’s electrical panel was rated for 2200 watts, which works out to 10 amps at 220 volts—not a good match for a 3600 watt (30 amps at 120 volt) US shore power supply. Issues extended beyond mismatched standards. AC wiring was sized for the higher voltage, lower amperage of a South African standard supply. It was undersized for handling the higher amperages that are normal in US systems. Equally concerning was that circuit breakers in the AC panel seemed to be at the end of their service life. Sometimes they would close, sometimes they wouldn’t. A new AC power system was needed. The first step was replacing the shore power inlet. For the boat side connection I opted for a SmartPlug, a new type of connector with some unique safety features. That project was documented in Installing the SmartPlug Shore Power Inlet. The next step was a new AC panel. VSM 422 Vessel Systems Monitor: a single device capable of monitoring AC power, DC power, tank fluid levels, and bilge pump activity. 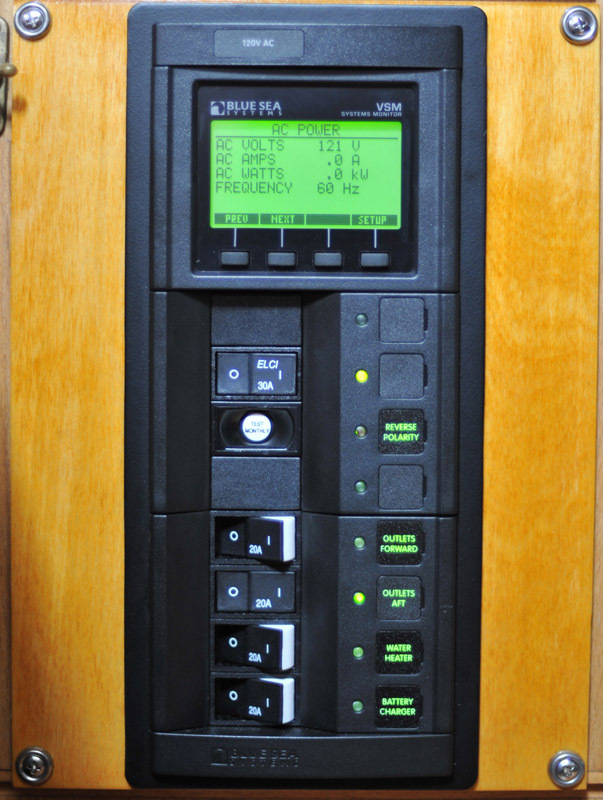 ELCI main circuit breaker: the ELCI trips open if there is ground fault. While the boat’s grounding system should protect boat occupants from a ground fault, the ELCI goes a step further and protects someone who may be swimming nearby from stray electrical current returning to ground. Distribution module: circuit breakers to control four AC circuits. I will dedicate a separate post to details of installing the panel but would like to share some opinions about the 360 system after using my panel for several months. For starters, I am a fan of the VSM 422 monitor. It works as advertised and there weren’t other products that do as much in such a small space or fall anywhere near this price range. On a larger boat with more available real estate, I probably would opt for multiple, dedicated meters and gauges. But the 422’s multifunction display does an excellent job and has a footprint well suited to my boat. I have two minor issues with this module. First, it is deeper than expected—so deep that it only fits in the available space sans rear cover. Interestingly, the extra depth is not a function of the VSM 422 but rather extended side walls of the plastic module housing. It’s unclear why only this module’s side walls were extended, since the added depth is not necessary to cover the back and it seems as if there would be enough room without the extensions for sense wires. Some day I may decide to remove those extensions myself, although right now it seems like an unnecessary chore. The other issue is the Euro connector. The advantage of such a wiring harness is that all the VSM’s wiring can be connected and disconnected at once. The disadvantage is that this type of junction is less secure than a ring terminal. In a perfect world I would prefer a lockable, detachable terminal block that accepts ring terminals. But overall as a compact and reasonably comprehensive monitor for a small cruiser, the VSM 422 is a very good solution. The ELCI and distribution breakers work well but also have a couple issues. The backlit labels and LED indicators are always on whether AC power is present or not. This consumes power unnecessarily and is misleading in that it suggests an energized ciruit even when no AC power is present. Also the small LED indicators that show when a breaker is closed are bright; spillover light from one LED can make another one appear to be lit when it’s off. The backside of these components is awkward. The ELCI has plastic tabs that shield the wire connections, which probably is a code requirement. The tabs necessitate bending the stiff, 10 gauge main AC wires around a corner to exit the back of the module. Also there is not enough room inside the 360 panel to bend open those tabs so connecting or disconnecting the main wires requires disassembling the 360 panel’s side walls. It’s no fun unscrewing and screwing together the 360 panel’s plastic pieces. I wondered each time how many cycles the plastic parts would tolerate before stripping. The distribution breakers are straightforward but I found the switch bodies surprisingly deep. Given the tight spaces available in the boat, a half inch of depth matters. Double pole breakers are available and might be shallower (?) but they take up twice the space and four of them would have required two 360 modules instead of one. I chose single pole breakers and Blue Sea included a dual bus bar to be mounted externally as the neutral and ground posts. The 360 panel system offers the ability to design your own panel using a rich palette of off-the-shelf components. I believe it remains the only current offering with a marine-approved ELCI breaker. But compared to other manufactured panels it is clunky. If I were to replace it, the solution probably would be to use the VSM 422 and ELCI components while dispensing with the 360 panel system. For the distribution breakers, I would look at double pole breakers and certainly would look for a system with more sensible indicator lights and label backlighting.